Now, one thousand medications can easily be found through the iTriage medications directory or associated with any disease. iTriage is about empowering consumers to make the best healthcare decisions. Now we can help consumers connect the dots with medications and explore options with their physicians. Healthagen® today announced the addition of information on 1,000 medications within its free consumer healthcare app iTriage®, a trusted source for personal healthcare data. In addition, Healthagen introduced a new and improved interface making it easier for users to quickly access all iTriage features. According to a survey released by the market research firm Knowledge Networks and the Physicians Consulting Network, drug reference tools are some of the most popular mobile applications among physicians. Consumers also demand medication information as it relates to treatment of disease. Whether it is side-effect information, drug interactions, or generic equivalents, consumers want medication details at their fingertips. 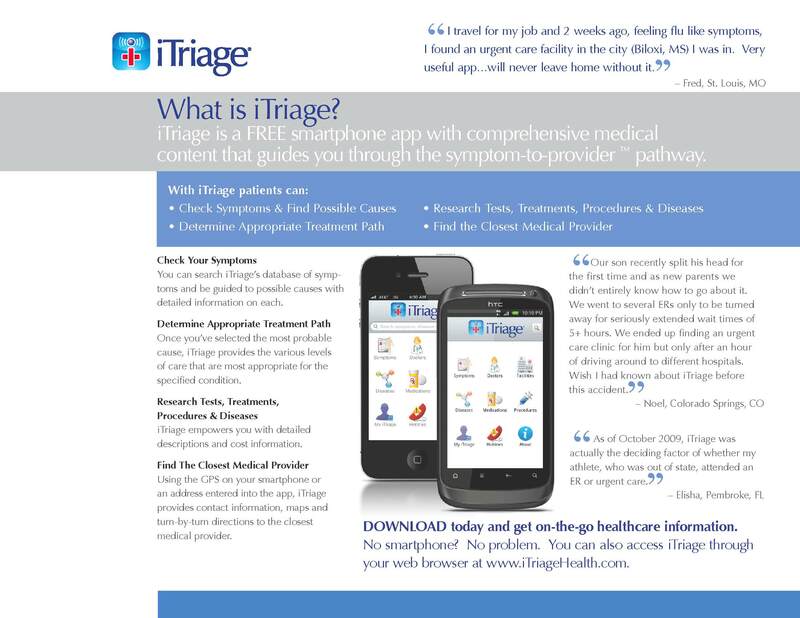 Consumers can easily download iTriage for free on the iPhone® and all Android™ smartphones and tablets. iTriage is also available over any mobile or desktop Web browser at http://www.iTriageHealth.com. Co-founded in 2008 by two emergency medicine physicians, Healthagen LLC is a privately held company headquartered in Denver, Colorado. iTriage, the company’s consumer mobile healthcare platform, offers a proprietary Symptom-to-Provider™ pathway that empowers patients to make better healthcare decisions. iTriage helps people answer the two most common medical questions: “What could I have?” and “Where should I go for treatment?” Millions of consumers around the globe have downloaded the free iTriage app on their mobile devices, and thousands of healthcare providers use iTriage to reach and communicate critical facility and service information to patients. For more information about Healthagen and iTriage, please visit http://www.Healthagen.com.